Ever twisted an ankle? Got a shin splint? If you've ever really worked on your feet, then you know that the area immediately above your feet is vulnerable, too. These Chippewa Men's Brown 20086 Steel Toe Vibram Sole EH 8 Inch USA-Made Logger Work Boots lace all the ... (see full details) (see specifications) #CHP20086. Ever twisted an ankle? Got a shin splint? If you've ever really worked on your feet, then you know that the area immediately above your feet is vulnerable, too. These Chippewa Men's Brown 20086 Steel Toe Vibram Sole EH 8 Inch USA-Made Logger Work Boots lace all the way up past your ankles to give you extra protection everywhere you need it. An American flag adds detail to the laces of these tall, brown boots. It's there to remind you that these Chippewa boots were handcrafted right in the USA. The 8-inch uppers are made out of chocolate brown apache leather, stuff that feels soft and flexible around your steps. The true power of leather is that it bends and moves with your feet to make movements comfortable when you wear these safety toe boots. Leather is also durable, resistant to normal abrasions and wear. Drill vamp lining adds lightweight fabric around your legs to put softness right next to your skin when you wear these steel toe boots. The comfortable insoles put even more softness right under your steps. Made with Chippewa's 5 Iron Texon construction, the cushioning insoles absorb shock before it impacts your feet and legs. Texon is soft, man-made material that creates contouring cushioning to match your steps. The Vibram 132 lug soles of these men's boots give your steps a firm foundation. Made with an exclusive compound, the tough soles give you maximum traction on wet or dry surfaces. You never know what you'll have to face when you're at work after all, so you need to be prepared for anything. The durable soles of these American-made boots maintain grip even in extreme temperatures, hot or cold. Triple-ribbed steel shanks help reinforce your arches, while 4 iron flex midsoles give your feet even more support and stability. Non-tarnishable, antique brass hardware makes the rugged exteriors even more durable, and the heavy duty wax Sta-tied laces give you a secure fit, every day. Angled lugs are what give you that great traction, even when you're going upward or moving downward. A center medallion in the lugs helps your steps grip the ground more firmly when you wear these loggers. The soles are EH rated to give you resistance to electrical hazards. They'll absorb dangerous electricity, and that will keep you safer when you're working. Steel toes provide more safety. The toe caps in these EH boots protect your feet from impact and compression. They're ASTM F2413-11 rated to meet standards for protective footwear. Chippewa Men's Brown 20086 Steel Toe Vibram Sole EH 8 Inch USA-Made Boots protect your feet, and they protect the stuff right above your feet. That's the kind of work boots you need when you're working hard. 3 out of 10 people found this product review helpful. I originally ordered these Chippewa boots Oct. 1 2013 in a 10 1/2 d days later upon trying these on the 10 1/2 is way too big, so back they go. A couple of weeks later I get my exchanged for size 10 d still too big, but tight in width on the toes but very loose in the heal. So before I send these back I find a local Chippewa dealer (40 miles away) to try to find the correct size that will fit me. Hoping that maybe by Christmas I will find boots that fit. Well I tried on different sizes, styles, models, etc... 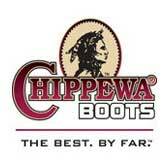 Unfortunately Chippewa does not offer a boot that actually fits my normal size 10 1/2 d feet. The closest was a 9 1/2 E but was on the short side and the heals were still loose. Replaced with Danner Boots USA made 10 1/2 d and the fit was perfect. Bought these boots a few months ago. They are well put together, and not too heavy for a steel toe boot. A little stiff to begin with but are breaking in nicely. I use them to protect my feet in my sculpture studio. Good for welding and working with metal. I added alight metatarsal guard and no longer worry about having a piece of steel roll off a table an land on my foot. They have been timely with all responses to my inquiries and I shop from them first. They have always been honest with me. Chippewa Boots: Men's Brown 20086 Steel Toe EH USA-Made Logger Boots is being added to your cart.